About to Bounce Inflatables and party rentals services the New Orleans area. 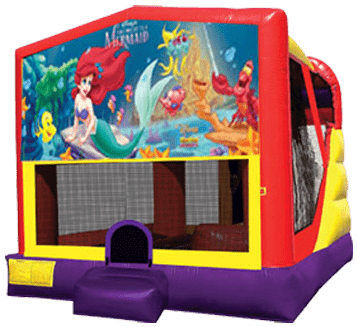 About to Bounce has the largest selection of bounce houses, combos, water slides, obstacle courses, interactives, sports games, carnival games, tables and chairs and concessions. About to Bounce specializes in mechanical rides such as mechanical bulls, gyroscopes, Meltdowns, Rock climbing walls. We rent to the largest church events, corporate events, school events, and backyard parties. About to Bounce is insured and licensed in the rental industry. About to bounce rentals takes safety and cleanliness very seriously. We have been serving the New Orleans area for over 12 years and have over 275 5 STAR Google reviews. About to bounce rents in these areas for Free to residences in the following areas. Ama, Arabi, Avondale, Belle Chasse, Boutte, Chalmette, Des Allemands, Destrahan, Gretna, Hahnville, Harahan, Harvey, Jefferson, Kenner, Luling, Marrero, Meraux, Metairie, New Orleans, Norco, Paradis, River Ridge, St. Rose, Terrytown, Violet, Waggaman, and Westwego. A2B has over a 100 different graphic banners for you to choose from in customizing your bounce house or combo bouncer rental. These are brightly colored, with crisp, clear images of all your favorite movie and cartoon characters. Dazzle your Little Mermaid fans with Ariel and her undersea friends. Or choose from characters like Dora the Explorer, Batman, Superman, and the cast from Ice Age! 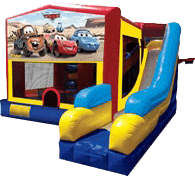 Just select the type of bounce house or combo bouncer that fits your needs and then browse through our amazing cast of characters and get ready to make your someone very happy! At A2B Safety is The #1 Priority! OMG! Check out the Meltdown! 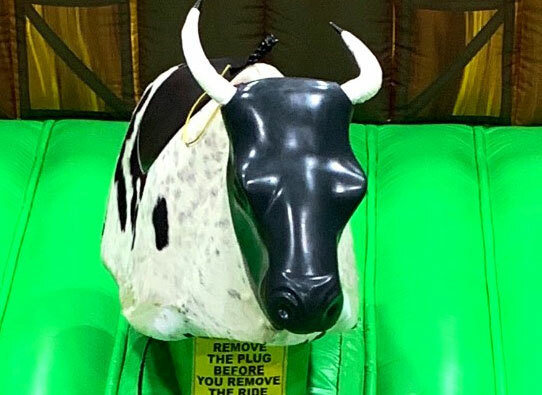 The Meltdown Inflatable Ride will turn your party into an adrenaline-fueled competitors battle as your guests jump and bound around an arena straight out of your wildest imagination. Two robust, swiveling arms will spin and try to knock the 8 players down. If you fall off the pedestal, you lose. If you are daft, dive, duck and dodge, you will emerge victorious. 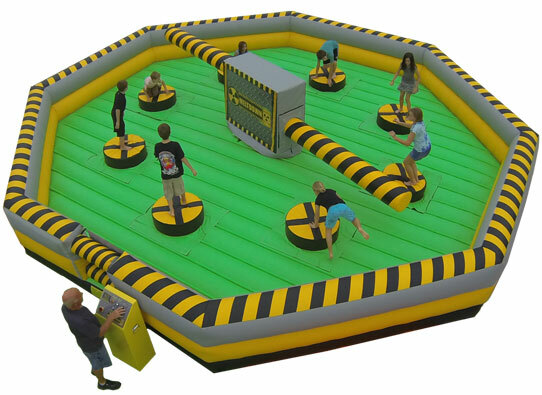 The inflatable arena is safe, and comes with an About to Bounce attendant that will operate the game. Imagine the excitement of the crowd as your 8 contestants battle the might of the swinging arms to stay upright and avoid getting knocked off their pedestals. 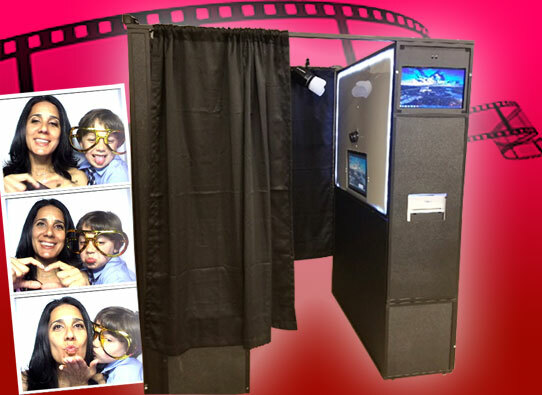 A classic photo booth rental is the perfect choice for giving your guests fun memories they can take home from the event and enjoy for years to come. Great for wedding receptions, family reunions, graduation parties, retirement, company events and so much more. About to Bounce has two styles of photo booths to choose from; the classic sit-down style booth for old fashion fun and our new kiosk style where the whole gang can get into the act. Multiple print styles available and custom themes for you photo borders. Give us a call at (504) 914-6489 for questions and details. Our photo booths are also equipped for social media sharing if desired. Mechanical Bull Rental-Giddy yup, partners! You know you have heard the roar of the crowd before. Whether you've been there in person, seen it on television, or heard the story of a wild rodeo, riding the bull and holding on is your heart races is a thrill unlike any other. That's why About to Bounce can bring a one-of-a-kind Mechanical Bull Rental to your party. Whether you're having a fundraiser, company party, Wild West-themed birthday party, or other special event, nothing will get the crowd going like the Mechanical Bull Rental. The "bull" is a fun ride for all ages, and comes with his own inflatable safety area and cowboy to make sure everything is safe. The "bull" is lightweight and can fit in any party setting. 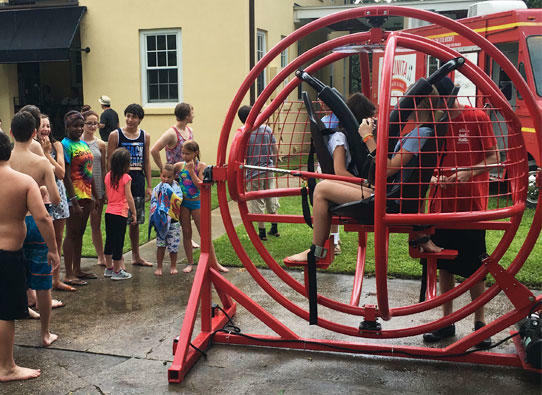 The Gyroscope Orbitron Rental secures two of your guests safely into two harness-equipped seats, and then the real fun launches into action. The Gyroscope begins a slow spin, turning faster and faster as the rider goes on. Are you ready to take your party to new heights? 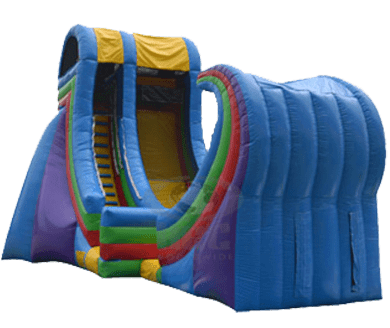 About to Bounce Inflatable Bounce House and Inflatable Water slide Rentals has the perfect piece to satiate even your most adventurous guests: The Rock Climbing Wall. 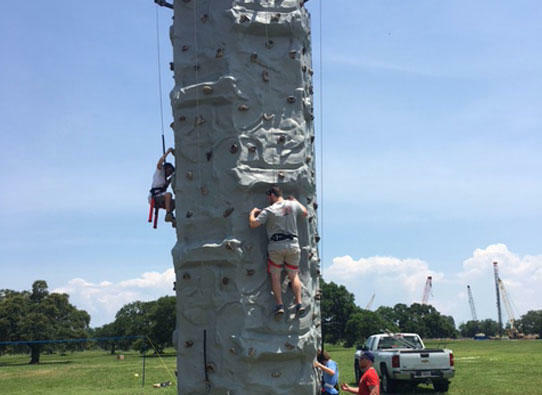 The Rock Climbing Wall combines everything your kids will love about kinetic wellness with the spirit of competition and the thrill of heights for your party. Four climbing points and safety harnesses are used by climbers to scale the side of the Rock Climbing Wall. Indentations and ledges along the way empower climbers to find their own footing as they use their strength to pull themselves up. With the harnesses providing safety, and the designated climbing points leading the way, it's a race to the finish! Book your Rock Climbing Wall for a two hour rental or more, today! 7 in 1 Combos Rock! Our 7in1 inflatable moonwalk combos feature a dry slide, climbing area, vertical pop-ups, horizontal pop-ups, a jumping area, a basketball goal on the inside, and on the outside. We have themed panels that can be attached to the front of the moonwalk to give your event an even more decorative look. About to Bounce has a complete line of toddler inflatable rentals design specifically with your smallest guests in mind. These charming rental units have the latest safety features that parents love, along with themes like Mickey Mouse, Hello Kitty and a Disney princess palace. See them all here! The Rampage, New Orleans Best Water Slide! This 21 foot high water slide is called the rampage water slide for a reason. You have a huge lane for a rider to come down and go back up and come back down. This slide has a landing where you end up. This is one of the many great water slide selections you'll find at About To Bounce Inflatable Party Rentals. Heights range from 12 feet to 27 feet high. When you get all the way to the top if feels like you can almost touch the sky. There are many different options like color, shapes, and sizes. In the end, no matter which one you choose it's always a grand ol' time. Now one of the most popular table games has gone "Life-Size". FOOSBALL! A human sized inflatable area, 10 players and popular game make for an event like no other. Players hold on to their play bar which slides side to side facing off againt their opponent. Fabulous for corporate team building events, School and church festivals and the best backyard birthday ever! You can build teams up of random players at any event, or organize teams for your friends to compete. It's also great for corporate team building excerizes or church group fundraisers. The opportunities are endless, so get your game on! The Best Laser Tag Arena Ever! Are you ready to pull out all the stops? Are you going to be the one who provided the ultimate in party entertainment? 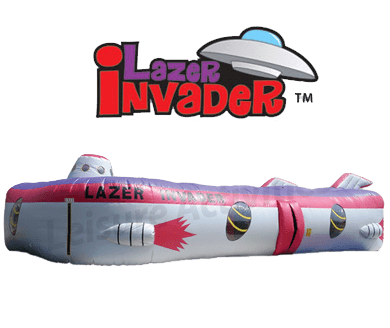 If you want your guests to be talking about how much fun they had, is not for months then years to come, you're going to want none other than the About to Bounce Laser Tag Arena with 10 laser guns. Laser tag is often a hassle, and you have to go to a specific location and jump through a ton of hoops just to have a good time; albeit brief. 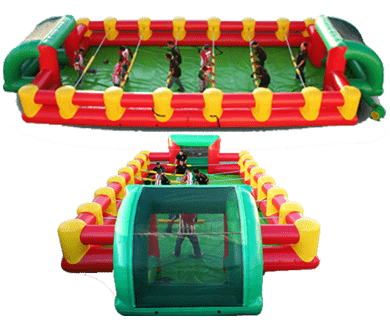 That's why About to Bounce has what it takes to bring laser tag right to your party, with a 44' x 24' arena with 10 foot high inflatable walls for maximum safety. 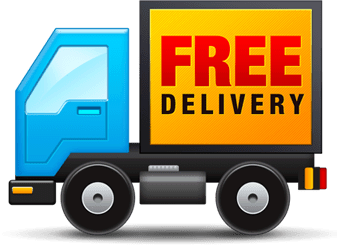 Free Delivery to Select Locations! That's just part of the deal when you're one of our New Orleans and surrounding area customers. That's what folks have come to expect from About To Bounce; great inflatables, cool party equipment & games, and service you can trust. Check out complete delivery information on our service area page. Thank you for reassuring my paranoid mother that the kids wouldn't hit the tree if they fell off to the side. Your demonstration she said was very reassuring and funny to say the least. I hope you enjoyed it as much as they enjoyed watching. It's been a while since I've rented a bouncy house, but my family rents from time to time, the last time I did I remember having an issue with making my payment online. Other than that, About to Bounce will always be my 1st choice because the quality and customer service is outstanding!